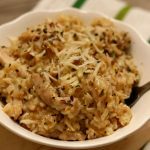 Brown rice is cooked with garlic, onion, lemon juice and juicy chicken thighs for an easy one pot dinner that’s low on effort and high on taste. Turn your Instant Pot to the saute setting. When the display says HOT add in the olive oil and swirl it around. Add in the onion and stir. Saute the onion for about 3 minutes and then add in the garlic cloves. Saute the garlic for 30 seconds and then add in the chicken broth. Add in the rice, salt, 2 Tbsp of the lemon juice. Nestle the chicken into the pot and sprinkle with the lemon pepper seasoning. Cover the pot and secure the lid. Make sure valve is set to sealing. Set the manual/pressure cook button to 22 minutes on high pressure. When the time is up let the pot sit there for 5 minutes and then move the valve to venting. Remove the lid. Stir in the butter, parmesan and 1 Tbsp lemon juice and lemon zest. Salt and pepper to taste.